This manuscript was later published in Physics Letters B (Phys. Lett. B vol. 664, p. 162 (2008)). The authors described a curious result of some beautiful experiments with ions stored in a ring at GSI in Darmstadt, Germany (GSI accelerator site). The authors were interested in the Weak decay process of electron capture by radioactive ions. The ions were hydrogen-like: they had been nearly fully stripped, removing all of the atomic electrons except the last one. In this case, it is interesting to consider what the electron capture decay rate compared to the case of the neutral radioactive atom. Loosely speaking, the electron capture decay rate is proportional to the probability to find an electron at the nucleus. This is because the semi-leptonic Weak Interaction responsible for this decay is effectively a point-like interaction at these energies. The very massive W boson exchanged between lepton current and quark current does not propagate far at all. So it's a pointlike interaction, wherein the quark content of a nucleon changes, and the electron "becomes" a neutrino for the lepton current. You would think that because the electron density for the hydrogen-like ion is different than for the neutral atom, the electron capture rate would be different: the remaining, innermost K shell electron is tightly bound now and has a slightly higher density at the nucleus, while the small contributions to electron capture decay from the other K shell and the L, M, ... electrons is now gone. That would be interesting to study. The group at GSI loaded radioactive ions into the storage ring, and then using a very sensitive technique, they can tell exactly when the nucleus decays. When the nucleus decays, its mass changes, and the energy released in the electron capture (EC) decay is carried away by the electron flavor neutrino and the daughter nucleus. Those are the only two particles in the final state. The daughter ion is retained in the ring, and after the ions cool again in their orbit, the daughter ions can be detected as they pass by a Schottky diode pickup, and by measuring the little current pulse as the ion flies by, the ion can be identified by its orbital period in the ring. The daughter ion has a different mass, so its orbit frequency changes. A Fourier transform of the pickup signal identifies the ions. It is possible to detect when the ion decays by electron capture since the Fourier spectrum of the pickup current now develops a new peak at a specific time. The group performed the experiment, mapping out the decay curve of several hydrogen-like isotopes: 142Pm, 140Pr, and later 122I (iodine 122). A very interesting trend emerged in the data. Initially, the data and analysis of the statistical significance of the oscillation seemed a little fishy, but if you applied statistical tests carefully and fit the data, there was a well-resolved oscillation. It didn’t seem to be an artifact, although statistics were not very good. But an oscillating decay rate is very interesting. You can show (quite rigorously) that this dictates strictly exponential decay. Note that we haven’t said anything about quantum mechanics here, in fact. If and only if you violate any of those assumptions, you have a decay curve with some other time behavior. Any violation of these assumptions in the electron capture decay experiments caused by neutrino mixing would be New Physics. If the decay has an oscillating component and is not purely exponential, it means that there is something measurable, knowable about the initial state as it begins to decay. There must be more information in the problem than we expected (when we expected exponential decay). Think of it this way: something must set the initial phase of the oscillation term. Something at T=0, right at the beginning, the initial state. In other words, the initial state “knows something” (contains some information) about some little coupling between some states in the problem. But what are those states? The oscillation period was about 7 seconds. In fact, the authors measured the oscillation period quite precisely, since measuring frequencies is relatively straightforward. That’s a very slow oscillation period compared to the other “natural” frequencies in the system. The ions themselves have an orbital period of about 30 MHz. The hyperfine splitting of the ions’ ground state is about 1 eV or 1016 Hz. The interaction of the ion’s magnetic moments (electronic and nuclear) with the magnetic fields of the storage ring would also have high natural frequencies. Nothing seems to be 0.14 Hz (7 second period). But the authors at GSI argued here (arXiv/0801.2121) and here (arXiv/0804.1311) that the very slow oscillation frequency could be rather easily numerically related to the masses of neutrinos. This is a revolutionary hypothesis! 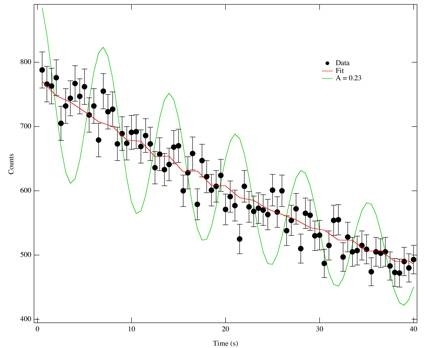 It would mean that you can measure the neutrino mass differences very precisely (and arXiv/0804.1311 has a very precise determination of neutrino mass differences), in an experiment not related to neutrino detectors! The GSI authors argue that the neutrino emitted in the electron capture decay is a mixture of mass eigenstates. And that the momentum of the daughter nucleus is entangled with the state of the neutrino, since if the neutrino has mass |m1> = light, then the daughter nucleus must have a slightly different momentum (by initial and final state momentum conservation) than if the neutrino has a mass of |m2> = heavy. The problem with this argument, however, is that the neutrino and the daughter nucleus is the final state of a decay process. And distinct final states (neutrino exists as mass |m1> or |m2> are not summed coherently when calculating a decay process rate (using Fermi’s Golden Rule). You can restate this objection in several different ways if you like (as has been done here (link), here (link), and here (link) ), basic quantum mechanics says that an oscillating decay rate must be due to some mixing in the initial state, and never never in the final state. So: if the oscillation is caused by neutrino mass/flavor mixing in the initial state, that would mean that the initial nucleus contains information about the neutrino state at its formation. If that were true, then this mixing and oscillating decay rate ought to be present in any electron capture decay – the GSI group produced the radioactive isotopes in a very conventional nuclear reaction, then slowed and captured the reaction products using conventional (although admittedly clever and difficult) techniques that apparently leave the neutrino information intact. Could you detect the neutrino mixing in a simpler experiment on electron capture decay? This argument means that we should be able to observe the GSI oscillation effect in a different experiment on electron capture, if it truly was caused by neutrino mixing. If that were the case, you could study neutrino mixing in very simple experiments where you measured the decay lifetime oscillations, and studied those oscillations for signals related to the masses and mixing angles of the neutrinos. You wouldn’t have to go underground and use huge neutrino detectors that cost many millions of dollars or euros. So we did such an experiment using the Berkeley Gas-Filled Separator (BGS) at the 88-Inch Cyclotron at LBNL. 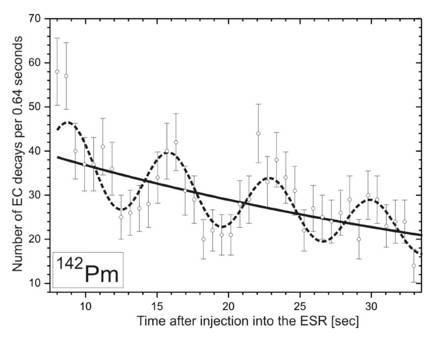 We produced the same isotope as one of the cases used at GSI: 142Pm (promethium 142). We used a beam of 23Na on a tin target at the entrance to the BGS. The 142Pm produced by the reaction 124Sn(23Na, 5n)142Pm flew through the BGS into the final focal target chamber, where it was stopped by striking an aluminum foil located in front of a large germanium detector. The germanium detector had a thin front window and had good sensitivity to low-energy X-rays, which are emitted as atomic electrons rearrange after nuclear decays. Those X-rays can be very useful in determining exactly what’s happening in the BGS (link). When the 142Pm decays by electron capture, it predominantly captures an innermost K-shell electron, since that’s the one that spends (by far) the most time inside the nucleus. The other electrons in the atom have a tiny effect on the decay rate. And when the K-shell electron vanishes, it becomes a neutrino, just as in the case of the hydrogen-like 142Pm in GSI’s storage ring. The new daughter nucleus 142Nd now has an electron vacancy in its K-shell, which is filled by other electrons cascading down from higher levels into the K-shell. When that happens, an X-ray is emitted, with an energy characteristic of the charge of the final nucleus. Detecting those X-rays precisely labels the exact time that the electron capture decay happened, relative to the cyclotron beam pulse that produced the nuclei in the first place. So we produced the 142Pm with a short beam burst from the cyclotron, then counted the X-rays at the correct energy. Lather, rinse, repeat. No oscillations, just an exponential decay. You can play with the statistics of fitting a sinusoid to exponential decay data to figure out a limit on how small an oscillating term you might expect to resolve, but the basic answer is that we would have seen an oscillation, even if it had been a factor of about 30 smaller than that seen by GSI. The green curve is what we would have seen if the effect had been as large as observed at GSI. This means that there must have been no information in the initial state of 142Pm about the neutrino mass mixing. Darn. Here’s our paper, which we submitted to the arXiv (arXiv/0807.0649), and later published (Physics Letters B). At about the same time, a group working at the Technical University at Munich performed a very similar experiment on the electron capture decay lifetime of the isotope 180Re (arXiv/0807.3297), also finding no oscillation. So what does cause the oscillation of the electron capture lifetimes of the ions stored at GSI? That remains a very interesting question. It can’t be neutrino mixing (it violates basic quantum mechanics if the neutrino mixing is in the final state, and if the neutrino mixing is in the initial state, then it would have been seen in other experiments). Consider that I haven’t told you about one very important feature of all of the parent ion systems examined by the group at GSI: 140Pr, 142Pm, and 122-Iodine (link). They all have a parent nucleus with spin I = 1 and a daughter nucleus with spin I = 0. The initial ion spin state is F = I + J = (nuclear spin = 1) + (electron spin = 1/2) + (electron orbital angular momentum = 0) = 1/2 or 3/2. The final state has just the nuclear spin = 0, and the neutrino spin = 1/2. The neutrino is emitted (in lowest order) in an S-wave, so no orbital angular momentum there. So the initial parent nucleus can only electron capture decay if it is in the hyperfine state F=1/2. The F=3/2 state is “sterile” to electron capture. The ions are in the lower F=1/2 state when loaded into the storage rings, and it is usually assumed that the hyperfine state of the ions cannot evolve out of the F=1/2 state. But if the hyperfine state can evolve in time, then there could be some way of changing the basic exponential decay of the ions. In this case, the initial states which have “information” are the hyperfine states or sublevels, and the Hamiltonian governing the time evolution of the state was more complicated than we had so far assumed. This seems untenable as an explanation. It involves a very fine tuning. That is, the Thomas precession frequency can be calculated to be the difference of two large numbers, and to make the frequency work out to be 0.14 Hz, you have to have very good cancellation in that difference. There is a basic consistent story here, but you need to know the nuclear charge radius of all three of the isotopes to very high precision and it would have to work out just so in each case. Doesn’t seem likely. This seems tenable. The basic story is that in the magnetic fields of the storage ring (which are large), the ground state |F=1/2> hyperfine state is split into Mf = +1/2 and -1/2, and that transitions between these two states can be driven by high order harmonics of the magnetic field components of the large magnetic fields (particularly the focusing fields which specify the ion orbits). These fields have time dependent harmonics in the rest frame of the ions as they repeatedly fly through the mangets. The power of the explanation in terms of Rabi oscillations is that the oscillation frequency of the electron capture decay corresponds to the Rabi flopping frequency, not merely the frequency you might expect from the energy differences of the states in the problem. So even though the energy differences of hyperfine states and sublevels are large, you can generate a low decay oscillation frequency by coupling to the time-dependent fields. It’s like a giant molecular beam apparatus with huge RF fields. But the details depend on exactly the orbital parameters of the ions in the ring, and exactly what magnetic field components they are exposed to during their orbit. It could in principle be the answer, but it requires some more detailed knowledge about ion orbits and the field amplitudes of fiddly off-axis components. This explanation could also explain the mass dependence of the effect (decay oscillation period proportional to the ion mass) which is suggested by GSI to be a strong confirmation of the neutrino mixing hypothesis. This is because the nuclear magnetic moment of all of the isotopes they used is rather similar (odd-odd nuclei), and runs with mass. Regardless of HOW the hyperfine states evolve, IF the hyperfine state evolution is the explanation, then the oscillating decay effect should disappear in cases with different spin selection rules, or different magnetic moments. There are several cases of isotopes in this general mass range, with substantial electron capture probability, with reasonable half-lives, with a nuclear spin such that there is no sterile hyperfine state in the parent. There are also cases in which the nuclear magnetic moment has the opposite sign. Parent (J) Daughter (J) Half-life Intensity to g.s.